Just around December 2018 I was voted in a member of the Potomac Valley Padio Club, PVRC. 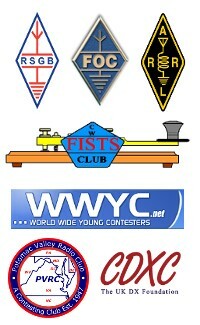 Since then I’ve been operating contests from a variety of PVRC member stations. 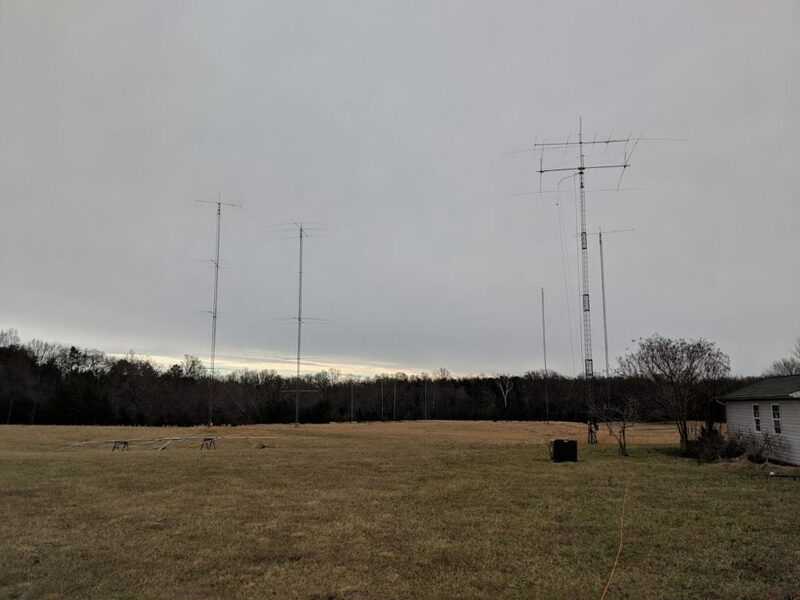 At a PVRC event just before Christmas I got chatting to Dan W0CN and he invited me to head on down to The Goat Farm and join the team at NR4M in the ARRL DX CW Contest. CW is certainly my thing and I rather like team contests as they add a social element to something that would otherwise be one man one radio. I didn’t get chance to visit the station in advance of the weekend and I arrived an hour after I planned due to traffic conditions on Friday afternoon. However, Steve NR4M was very welcoming and gave me a station and antenna tour before we all went off for a pre-contest meal at a local restaurant. Full details of the station are on Steve’s website, http://nr4m.com/ . Part of the NR4M sshack from the view of the 20M multiplier position. Walking from the bunk room to the station, a view of some of the antennas. There are more towers and various arrays. 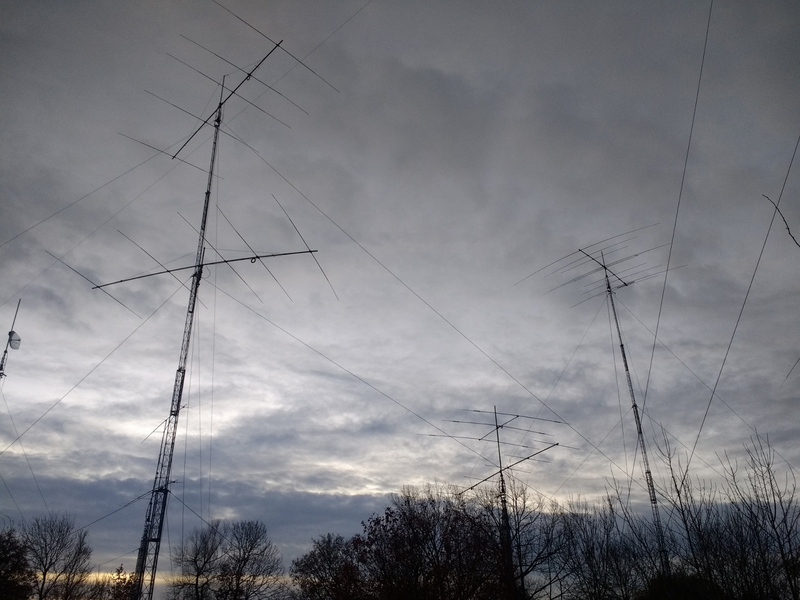 It was a pleasure to operate, mostly on 20m running with some multiplier hunting on 40m, 20m, 15m and also a little activity on 10m. This is a unique event as it’s only open to FOC members. I was operating from home as AD5XI with 100W into the dipoles in the attic. I only did a little S&P, mostly spent my time CQing and working all callers. I’m still not used to how the bands play from here. QSOs from 80m through 15m. Tried 10m once but no activity at all up there. I started a bit late for 40m and never had a great deal of QSOs there, 80m was surprisingly good given my shortened loaded dipole in the attic. 20m was the most productive band, and 15m the least but those I heard on 15m were easily worked with my 100W and dipoles in the attic. Worked a bunch of 4-banders, but as 10m was dead and I don’t have a 160m antenna at all then 5 and 6 banders were going to be impossible. My DXCC totals have also been boosted by this event on each band, which is to be expected as I started out at 0 again in November ’18. 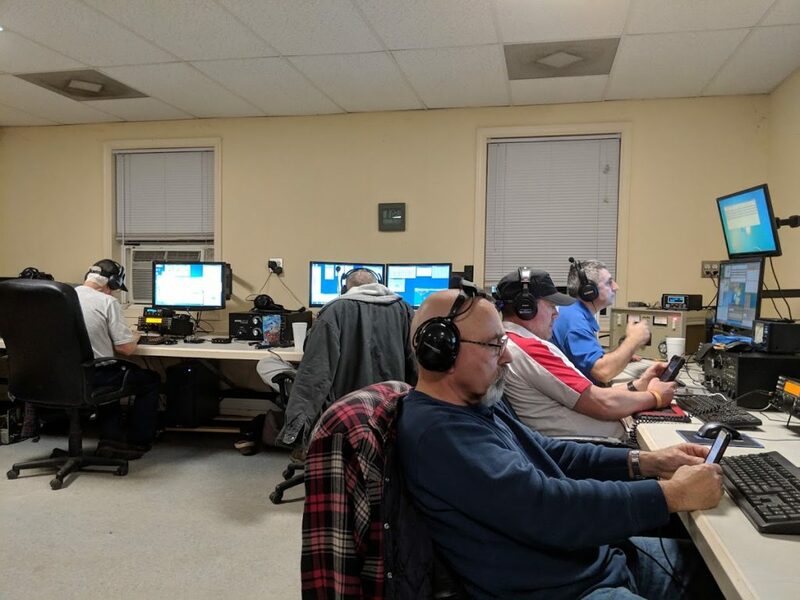 Over the weekend of January 19/20th I spent time at WA3EKL operating as part of the M/2 team for NAQP SSB. My original intent was to try out some VHF data mode contesting, but as it happens I had a blast in NAQP. It had been something like 3 years since my last SSB contest, so it took a little time to get back into the swing of it. I only tripped over the call a couple of times. Having not done any of my own voice recordings I ended up shouting at the microphone rather more than the others did. This was the first contest I was active in from home, and my first NAQP. A very enjoyable domestic contest. It was interesting to see how many times I mis-copied as AD5X. Usually got queried after sending my name a coupe of times. When I arrived in Maryland I was recommended by a few people that the Potomac Valley radio Club was a club to join. 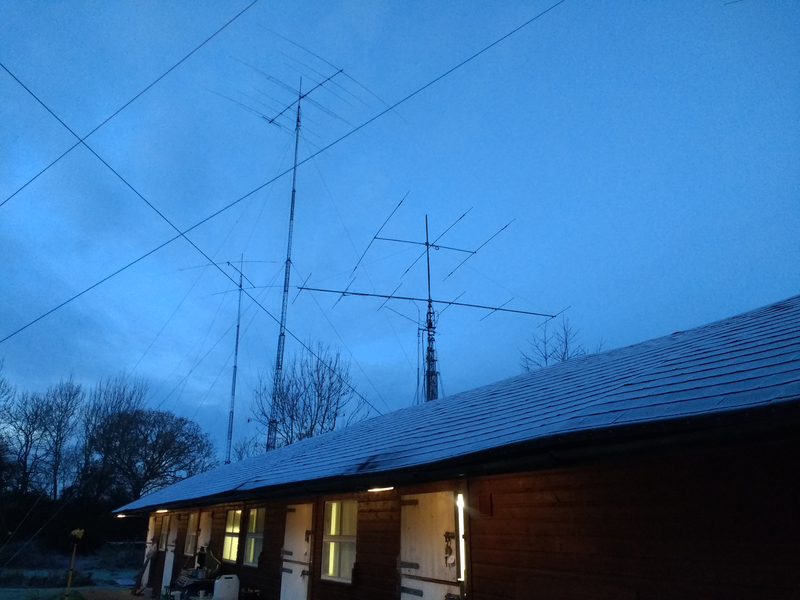 They were quite right, and even before I had my own shack set up at home I was invited by Alan WA3EKL and Susan N3DPB to join their team for various contests. Unfortunately my shipment of personal effects arrived from the shipping company on the Saturday afternoon of CQWW CW, but on the Sunday I spent a few hours on the air as N3DPB. Mostly on 40m and 20m. This was the first contest of 2018 for me. I was late home after a 7 mile hike in the morning so missed the first 40 minutes of the contest by the time I got into the shack with a mug of tea. 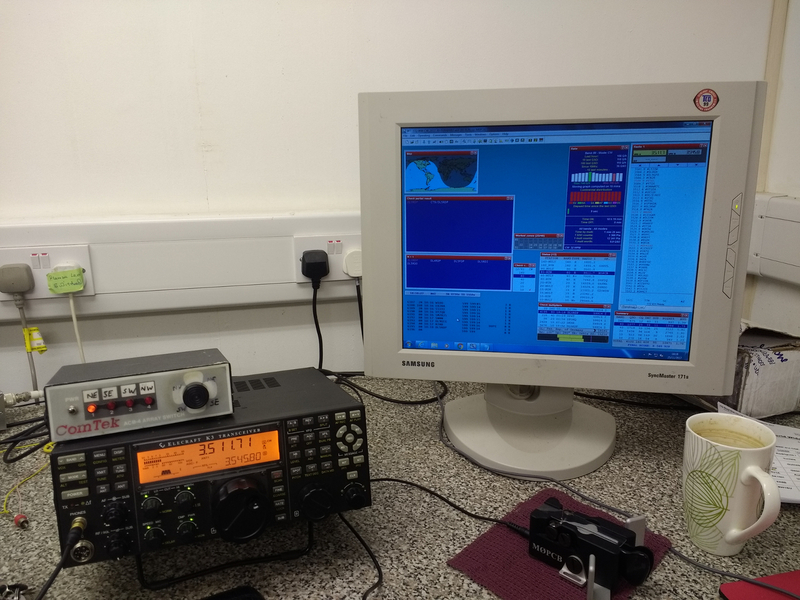 Conditions on 40m weren’t great though I did manage to work a few English stations. The strongest signals on 40m were certainly from Scotland and Europe. I started the contest So2R but found a problem with the K2 and KPA500 so switched over to the K3 for both bands SO1R. 80M was better and this is where the bulk of my QSOs were. I decided to run 400W in the end, and with the Inverted-V dipole for 40m and the 26m Inverted-L for 80m. A total of 202 QSOs were logged, with one duplicate. I don’t have a particularly efficient aerial for 160m but this contest was fun. Running the K3 and KPA500 to 250W I managed 100 QSOs in the log, unassisted. Surprising to have VO1HP call me and complete the QSO. This was the only one of the UKEICC 80m series that I managed to enter in 2017. I made 54 QSOs with stations in 34 grids. Rig was the K3 with 100W into the 26m Inverted-L antenna. You are currently browsing the weblog archives for the Contesting category.